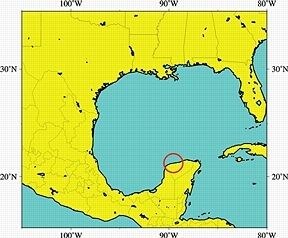 Red circle represents the Chicxulub impact crater in northwestern Yucatan peninsula produced by the violent impact of an object about 6 miles (10 kilometers) wide when dinosaurs were alive on the earth 66 million years ago. Asteroid, or comet, it punched through 22 miles of the earth's crust and is thought to be the extinction event that annihilated more than 75% of all earth life. Map courtesy of marine geophysicist Gail L. Christeson. January 7, 2001 Austin, Texas - Sixty-six million years ago more than 75% of all living earth creatures died. It was the end of a warm period called Cretaceous and the beginning of another named Tertiary. At that "K-T boundary," as scientists call it, there was a major, worldwide change that exterminated the dinosaurs. Experts have argued about the cause of the global extinction for at least two centuries. Twenty years ago physicist Luis Alvarez and his geologist son, Walter, reported the discovery of a worldwide layer of clay that has a high iridium content right at the K-T boundary layer in the earth's crust. Iridium is rare on earth, but abundant in some comets and asteroids, so the Alvarez team theorized that a comet or large asteroid must have hit the earth. When scientists looked for the greatest concentration of iridium, the data took them to the northwestern corner of the Yucatan peninsula in the Gulf of Mexico. There they found the massive 60-mile wide underwater crater called Chicxulub now thought to be the impact site.